I am such such a big fan of my guest this week Kelly Resendez she’s the EVP of Sales and Business Development for Paramount Partners Group which is a division of Paramount Equity Mortgage. Kelly is just a rock star. She’s a top producer consistently ranked in the top 1% at every company she’s worked at over 20 years in the industry. Since 2011 she’s been the EVP of Sales for Paramount Equity Mortgage. Kelly has the plan, the tactics and the strategy for helping you become more efficient and effective in your business. 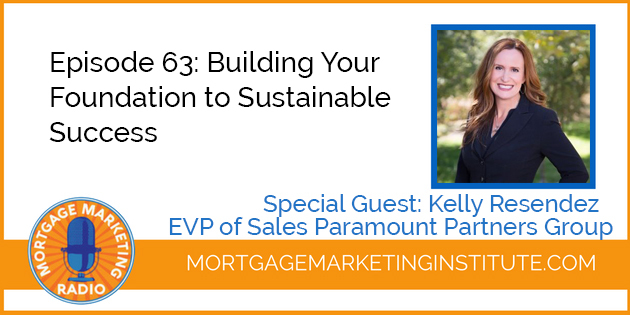 Kelly just published a brand new book: Foundation to Sustainable Success: A Conscious Guide to Mastering the Mortgage Business. You can also check out the Free resources available on her website.